Former US central bank chief Alan Greenspan has agreed to become an honorary adviser to the UK Treasury. The announcement by Chancellor Gordon Brown came less than seven hours after Mr Greenspan's near 19-year tenure as Federal Reserve chairman ended. Mr Brown said his new adviser would help the Treasury in the UK develop its thinking in areas relating to global economic change. Mr Greenspan has also launched a new consulting firm, Greenspan Associates. His role at the Treasury will apparently involve regular meetings and exchanges of papers - but no pay cheque. Mr Brown described the appointment as "good news for us". "I am delighted that Dr Greenspan has agreed to be honorary adviser," he said. "His advice on issues relating to global economic change will be much appreciated." 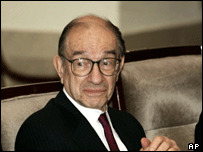 Mr Greenspan was given an honorary knighthood in 2002. He has previously described Mr Brown as being "without peer amongst the world's economic policymakers". On Tuesday Mr Greenspan presided over his last meeting of the US Federal Reserve, which raised interest rates for the 14th time in a row. During his time at the helm Mr Greenspan guided the US responses to the stock market crash of 1987, the emerging market crisis of the 1990s, the dotcom bubble of 2000 and the 9/11 attacks. Mr Brown has called him "the world's greatest economic leader of our generation". He will be the only honorary adviser at the Treasury.